Documentation: Photograph: 17 Dec 1992 Sutherland Reservoir, Lincoln Co (Dinsmore and Silcock 1993, Rosche 1993, Gubanyi 1996). This species breeds in small colonies in the North American Arctic, notably in the southwest Hudson Bay area, where breeding was first noted in the 1970s and 1980s (Howell and Dunn 2007); wintering grounds are the Bering Sea (Olsen and Larsson 2004). Small numbers occur in the Interior. There are nine records from surrounding states (as of Jan 2016); four from Iowa (Iowa Records Committee reports of Iowa rare bird records, accessed 21 February 2018), three from Colorado (Colorado Bird Records Committee), and one each from Kansas (Thompson et al 2011) and Wyoming (Faulkner 2010). These nine records are in the periods Apr-May (1) and Oct-Jan (8). Interestingly, the only spring record, from Colorado 28 Apr-6 May 1983, occurred in the same year that an incursion into interior Alaska took place (Howell and Dunn 2007). Photograph of a Ross’s Gull at Gavins Point Dam, Cedar Co 1 Dec 2010 by Cory Gregory. Dinsmore, S.J., and W.R. Silcock. 1993. 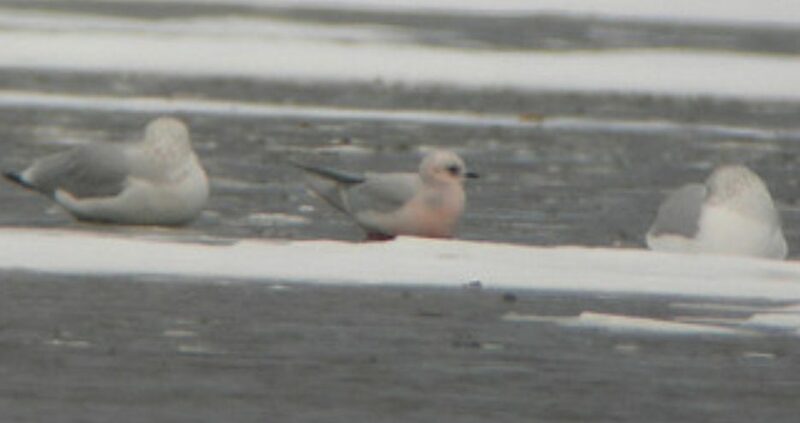 First record of a Ross’ Gull for Nebraska. NBR 61: 88-89. Rosche, R.C. 1993. Another description of Ross’ Gull. NBR 61: 89-90.